Bleeper.io has a comprehensive ticket view system which allows you to create custom views which will serve specific tickets based on specific parameters. Although this is very useful you may wish to perform a single search, with specific query information, this is why we have developer the Bleeper Power Search system. This is as simple as entering the term you would like to search for and awaiting the results within the Search Results view. You will see the entire search query constructed cleanly in the Search Info area just below the search bar. The power search will suggest tags to you while you type, along with their relevant options. 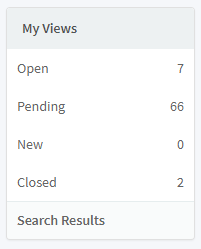 In this case the search bar is suggesting one of the available statuses (Open, Pending, New, Closed). You will notice that once again the full query is broken down into parts within the Search Info area below the search bar. As seen here, we are able to select a specific agent by simply using the “agent” tag, followed by an ‘@’ symbol and the agents name. This would then result in a new query which includes our preferred ticket status, the search term, and agent ID as seen in the Search Info area. Once a search is cleared, or an agent moves to a new view, this Search Results view will be discarded until the next search occurs.